I am currently in the midst of a raging love affair with Gabrielle Hamilton's Blood, Bones & Butter. I can't wait to crawl into bed at night so I can devour a chapter (or two, or three) before I pass out. Really there's nothing like a good foodie memoir to get me obsessing over a book. And that first chapter about her parents....dreamy. "Our house was in a rural part of Pennsylvania and was not really a house at all but still a domicile built into the burnt out ruins of an nineteenth century silk mill and our back yard was not a regular yard but a meandering meadow, with a creek running through it and wild geese living in it and a Death Slide cable that ran from high on an oak to the bank of the stream and deposited you, shrieking, into the shallow water." "My parents seemed incredibly special and outrageously handsome to me then. I could not have boasted of them more or said my name, first and last together, more proudly, to show how it directly linked me to them. I loved that our mother was French and that she had given me that heritage in my very name. I loved telling people that she had been a ballet dancer at the Met in New York City when she married my father. I loved being able to spell her long French name, M-A-D-E-L-E-I-N-E, which had exactly as many letters in it as my own... She pinned her dark hair back into a tight, neat twist every morning and then spent the day in a good skirt, high heels, and an apron that I have never seen her without in forty years. She lived in our kitchen, ruled the house with an oily wooden spoon in her hand, and forced us all to eat dark, briny, wrinkled olives, small birds we would have liked as pets, and cheeses that looked like they might well bear Legionnaire’s Disease." Are you currently reading anything that's rocking your world? This is definitely something I'd like. oh my gosh, you are my book soul mate, I LOVED this book. 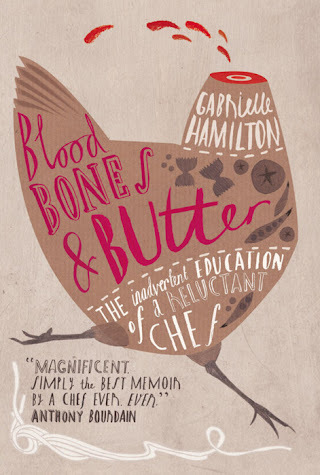 You should check it out from the library on CD, Gabrielle Hamilton narrates the story, it is even more magical! LOVED this book sooooooo much. One read of the dedication and I was hooked, "...you are my blood, my bones, and for sure, my sweet, sweet butter." I loved this book! I actually listened to the audio book with Gabrielle narrating it and it's just so good. And her restaurant Prune is great if you are ever in NY. Ps... Been reading your blog for some time now and I find it really refreshing. I just read The Happiness Project last week and. . .it really has rocked my world. I cannot stop telling people about it. Now off to locate a copy of this book, since I love food memoirs. Just read Mindy Kaling's book and would totally recommend it. I think I will definately need to purchase this one next. I'm a huge fan of the food memoir! If you haven't read them already, I highly recommend My Life in France and As Always, Julia and any of the Ruth Reichl books. I am loving State of Wonder by Ann Patchett. I couldn't get through Bel Canto so when my book club selected this one I was less than thrilled. But, I've been taken in by the words and can't get enough. I wholeheartedly second the listening of BBB on CD! You will LOVE hearing here read it as its meant to be read and she is hilarious! i would also suggest When French Women Cook by Madeleine Kamman, anything by M.F.K.Fisher, The Tenth Muse-My Life in Food by Judith Jones (who published all of julia childs books) and A Homemade Life by Molly Wizenberg who is kinda a big deal here in seattle and eveywhere i guess. enjoy! Oh, I loved that book. I read it last fall and felt so cozy being swept away by her amazing life! Another great read- "state of wonder", not so cozy but totally fascinating! Ah, currently reading Blue Nights by Joan Didion and it's totally rocking my world as she always will. Whenever I read her I tend to not remember my dreams. It's as if her writing and her world just takes over my subconscious and I wake up with really vague, but strong feelings and emotions each morning. Totally throws me off but in a way that I cannot get enough of - she kills me every time. I really loved this book! She used to have some holiday dinners with my family in Michigan (my aunt is Misty, who she writes about in this book), but I was too young to appreciate the full extent of her awesomeness. The book is so evocative and honest and totally made me salivate. I finished this book and loved it. What an interesting life Gabrielle has had! Reading it made me crave radishes with sea salt and butter. Foodie memoirs are my fave. I loved the first 2/3rds of BBB, but despised the last third, glad I read it though. Other great foodie reads are: Ruth Reichel's Comfort Me With Apples, Collette Rossant's Apricots on the Nile, Molly Wizenburg's A Homemade Life and, of course, Julia Child's My Life in France. Ooooh! I've read this- and loved it! So, so good!